Update – This TR3 has been relisted, but the seller has now lowered their starting bid to $1,900 with no reserve. You can find it here on eBay with 2 days to go! From 1/25/2019 – Just looking at this car immediately put my brain in illustration mode. 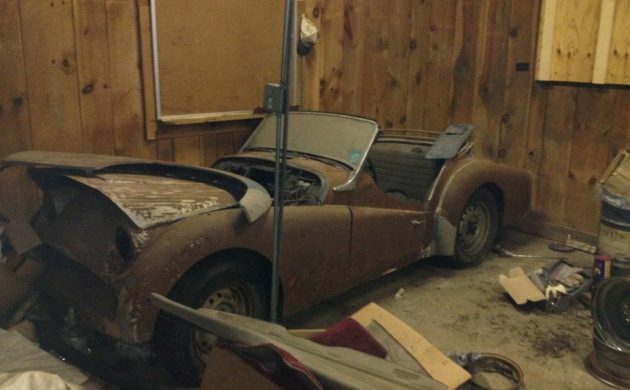 A rusty, in pieces, 1959 Triumph TR3, how could I not try to pitch it as a charge to attempt victory and “triumph”? 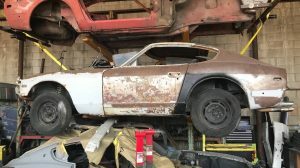 This pile of parts is currently at a starting bid price of $2,900 and resides in Greenwich, Connecticut. 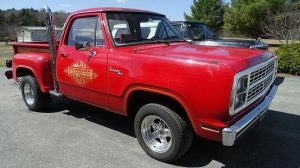 The seller points out in the listing that because there is no VIN, they are unsure of the actual year. You can view more on eBay. To start the path to victory, first, you must acquire a few items. 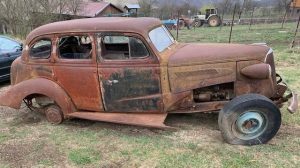 The car is lacking vital components like an engine and transmission. Depending on your vision for the project, you could source one from another Triumph, or swap in any host of engines you see fit. Apparently, mice called the car home in the past, so there could be damage from that. Information is key to winning. 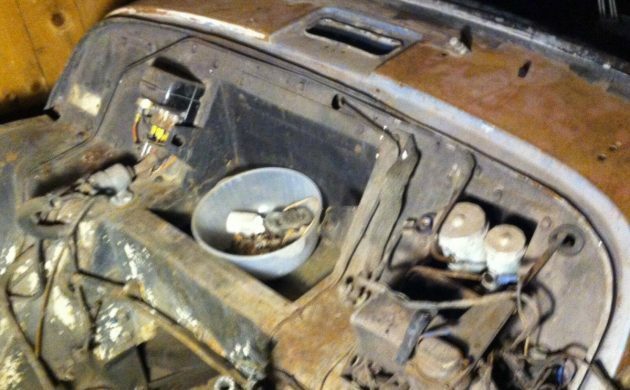 No interior components are in the car except for a dashboard and steering wheel. The floors, while there, do seem a bit rusty. 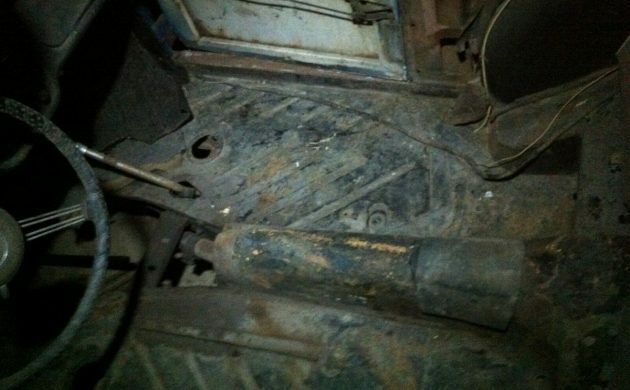 According to the seller, they have a transmission tunnel to go with the car. 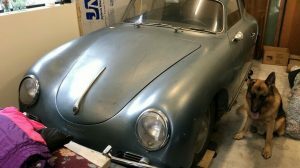 Fenders are available along with a trunk lid. They also say the tires should be spinning freely by the time of purchase. All respectable deeds to put you on the path of putting this thing back together. Wow! New fenders are $1,500-1,800 apiece! What a bargain! And the steering wheel has already been refurbished with the always tasteful lace-on cover. At least one too many 0’s in the asking price. Correct me if I’m wrong, but am I missing something here? Are old TR’s getting into E-type territory? I for one hope old TR’s never get into E-type territory price-wise. Speculators, most of whom don’t know the difference between a crescent wrench and a torque wrench, have succeeded in pricing some cars to the point the average Joe cannot afford one. To me, the Triumph marque has always delivered a helluva bang for the buck. And if I should spin a bearing or break a crankshaft, I don’t have to ask for permission from the Queen of England or the Pope to buy the needed part while taking a second mortgage on my house! Isn’t there a number stamped into the frame somewhere? If the V.I.N. plate is “missing” could this have been a stolen car, stripped for parts but perhaps still traceable via the frame number? Nope. The frame and engine were assembled and the body dropped on to it towards the end of the line. The bodies arrived from a factory somewhere near the assembly plant and would be stacked in a courtyard. They just grabbed the closest one and threw it on. So engine numbers rarely (if ever) matched and they didn’t bother stamping the commission number on the frame. All I can say for sure is that this was built after Sept 1957 and before Oct 1959. Sept 1957 is when it went to the wide mouth and Oct 1959 there was a major body retooling. the hinges for the hood were placed on little raised “plinths” that were stamped into the body panels. You can see the holes for the hood hinges in the second picture and it is flush with the rest of the panel. They did the same thing on the hood and on the trunk. Good starter for going historic racing, no? At a bid anything above $1, ones in the red on this one. Not sure if much is useable as parts – at least stuff that one would really need in a project. Having refreshed an MGTD and a TR3 at about the same time I can say that the TR3 is one of the simplest cars to work on and restore. Wish I was in the condition to take this on. Perfect father and kids project car. Definitely a TR3A, NOT a TR3B as the seller mentions in the ad. Body stampings put it built somewhere after Sept 1957 and before Oct 1959. The bonnet, boot lid, and cowl are definitely pre Oct 1959. It could be a ‘bitsa’ but the cowl in front of the windshield is something that doesn’t usually get swapped out. 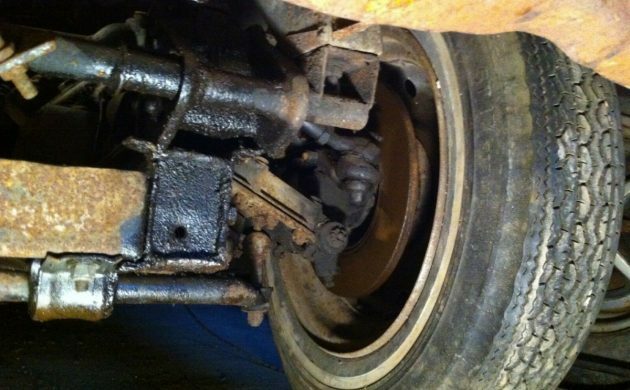 Without a motor the TR3B claim would be VERY hard to prove and none of it even matters without a commission plate. Call it a TR-whatever, put a TR3 or TR4 motor in it, and drive the crap out of it for fun! You’re never going to get your money back out of this one at this price.